The Middle Atlantic is the region of the United States that encompasses the states of New York New Jersey, and Pennsylvania. Additionally some people also include the states of Delaware, Maryland and Virginia, as well as Washington D.C., as part of this same region. Disco fries - Apparently popular in New Jersey, this dish consists of French fries covered with melted cheese and then chicken gravy. Eggs Benedict - Half an English muffin, with bacon or ham, poached eggs, and Hollandaise sauce. According to one story (there are several contradictory stories explaining the origin of the dish), eggs Benedict was invented by Lemuel Benedict, a Wall Street stock broker, as a hangover cure. 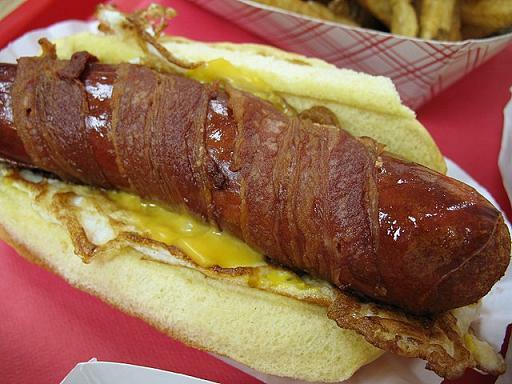 Jersey breakfast dog - A deep-fried bacon-wrapped hot dog, eaten with eggs and melted cheese. Manhattan clam chowder - A version of clam chowder. It contains the same ingredients as New England cuisine's clam chowder (cream or milk, clams, flour, onions, potato, and bacon or salt pork), but also contains tomato, which imparts a red hue to the soup. New York-style pizza - A style of pizza originally from the city of New York. It is thin, and is served (and often sold) in large very wide slices. The best, and traditional way to eat it, is to fold the slice in half. Pork Roll - A sausage-like product made from pork shoulder that originates from New Jersey. It is usually cut into slices, and then grilled or fried. Waldorf salad - A salad of apple, celery and walnuts in a mayonnaise dressing. The dish takes its name from the Waldorf Hotel in New York city, where the salad was first created during the late 19th century. With The Last O.G. Cookbook, you can keep the party going at home with recipes inspired by the hit TBS comedy starring Tracy Morgan and Tiffany Haddish. Morgan plays Tray Barker, a recently released ex-convict who, upon returning to his hometown of Brooklyn to find his girlfriend married to another man and his neighborhood gentrified, relies on his cooking skills to find his place in a city he often doesn't recognize. The soulful recipes in this book offer outrageously addictive taste sensations, combinations that may seem wacky but work wonders, and bold in-your-face flavors. Learn how to make mad-genius dishes such as Dessert Loaf, Wild-Style Lasagna, and Prison Pad Thai, as well as recipes that evoke the melting pot that is Brooklyn, both old and new, relying on African-American classics reinterpreted for the modern cook. In this vein are Tray’s Cornflake-Battered Fried Chicken with Sweet Pickles, Shay's "Somebody Died" Spaghetti, and Bobby's Blinged-Out Hoppin' John. With special features woven throughout that immerse you in the O.G. world, this keepsake volume will become a new standard for soul food cooking and a must-own book for every fan of the show. Figuring out what to make on busy nights can sometimes seem impossible―especially if you’re trying to follow the ketogenic diet. The One-Pot Ketogenic Diet Cookbook makes it easy to keep keto on the table every day of the week with family-friendly, one-pot meals for your skillet, slow cooker, sheet pan, stock pot, and more. With recipes ready to eat in under 45 minutes, this ketogenic diet cookbook is your go-to guide for setting the stress of staying in ketosis aside. Keeping things simple and delicious, The One-Pot Ketogenic Diet Cookbook helps you stay on track with the ketogenic diet and lifestyle. Home cooked meals that help you keep up with the ketogenic diet don’t have to be challenging or time consuming. On a mission to make keto convenient, Urvashi Pitre―the bestselling author behind Two Sleevers and The Indian Instant Pot® Cookbook―combines delicious low-carb recipes with the busy home cook’s favorite appliance: The Instant Pot®. The Keto Instant Pot® Cookbook is the only authorized ketogenic diet Instant Pot® cookbook for tried-and-true recipes that are ridiculously easy and fast to whip up. Do you want to lose weight fast, boost metabolism, and live a healthy life? Do you want to prevent osteoporosis, cancer, heart disease, stroke and diabetes? Eleven Madison Park is one of New York City's most popular fine-dining establishments, where Chef Daniel Humm marries the latest culinary techniques with classical French cuisine. No old school Bawlmer kitchen will be complete without this cookbook collector’s dream. It’s a journey with stops at Marconi’s, Angelina’s, the Belvedere Hotel, and many other landmarks from our region’s great gastronomic past. This book of Baltimore restaurants and their recipes is perfect for the cook who wants to capture Free State flavors of yesteryear, and serve them up on the dining room table. 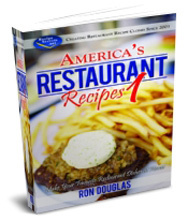 Readers will find classics such as Maryland crab cakes and Oysters Chesapeake followed by treasures like Haussner’s strawberry pie. This tour of bygone days in “the land of pleasant living” will leave you hungry for Crab Imperial, or dreaming of some special night in Louie’s Bookstore and Cafe, the Old Pimlico Hotel, or Baltimore’s Little Italy. Whether your favorite was the shrimp salad at Johnny Unitas’ Golden Arm, or Chesapeake Bay steamed crabs at Obrycki’s this is the perfect Maryland gift idea for any season. Enjoy! Given the right recipes, following the ketogenic diet doesn’t have to feel difficult or restrictive. Designed with variety and choice in mind, The Big 15 Ketogenic Diet Cookbook makes it simple to plan meals around naturally low-carb foods and stay in a state of ketosis. With 15 easy-to-find ingredients and tips for hundreds of recipe variations, this cookbook is your key to keeping up with the ketogenic diet. Recipes include: Santa Fe Frittata, BLT Wraps, Keto Chicken Cordon Bleu, Keto Meatloaf, Cauliflower Pizza, and much more. Eat healthier, lose weight, and taste how good a low-carb and high fat diet can be with The Big 15 Ketogenic Diet Cookbook. Chef Daniel Humm and his business partner Will Guidara are the proprietors of two of New York's most beloved and pioneering restaurants: Eleven Madison Park and The NoMad. Their team is known not only for its perfectly executed, innovative cooking, but also for creating extraordinary, genre-defying dining experiences. The NoMad Cookbook translates the unparalleled and often surprising food and drink of the restaurant into book form. What appears to be a traditional cookbook is in fact two books in one: upon opening, readers discover that the back half contains false pages in which a smaller cocktail recipe book is hidden. The result is a wonderfully unexpected collection of both sweet and savory food recipes and cocktail recipes, with the lush photography by Francesco Tonelli and impeccable style for which the authors are known. The NoMad Cookbook promises to be a reading experience like no other, and will be the holiday gift of the year for the foodie who has everything. Are you looking for recipes that fit your busy schedule? Are you looking for new recipes to try out in your Instant Pot? 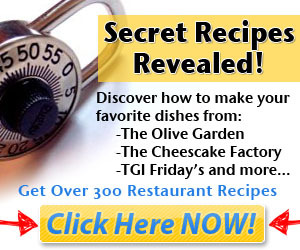 Are you looking for an easy way to prepare home cooked meals? Then Instant Pot for Beginners: Easy, Delicious Recipes Made Simple by Power Pressure Cooker Chefs can help! With these Instant Pot recipes, you’ll find everything you need to prepare home cooked meals any time of the day. From snack recipes to dessert, you’ll find treats to delight the whole family while preparing a tasty, breakfast, lunch and dinner as well. With so many recipes to choose from, there’s a little bit of something for everyone. There are even recipes that are perfect for your next party! Pull out your Instant Pot to start preparing delicious, home cooked meals today. Instant Pot for Beginners: Easy, Delicious Recipes Made Simple by Power Pressure Cooker Chefs is your answer to quick and fun recipes, your entire family will love! Press sauté, and then add in your oil. Once your oil is hot, add in your onions and garlic, cooking for three minutes. Make sure to stir so that your garlic doesn’t burn. Add all remaining ingredients except for your sour cream. Seal the lid, and cook on high pressure for twenty minutes. Stir in your sour cream before serving warm.